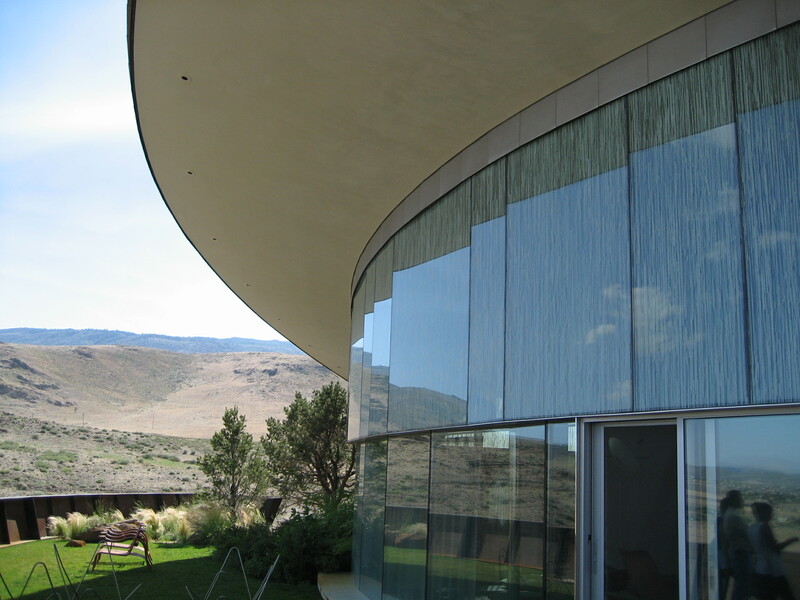 The sagebrush that grows rampant in Reno’s highlands is almost enough to mask Stuart Feigin’s low-lying 7,672 square foot home, a steel, glass and concrete structure that undulates and disappears into the desert landscape. Feigin, an art lover, served on the Nevada Museum of Art’s board of trustees when architect Will Bruder was finishing his work on the Reno museum in 2003. It was then that they met, and Feigin approached the internationally renowned architect about designing his home. Bruder, formally trained as a sculptor, says couldn’t resist the spare, high desert site with its entrancing long-distance horizon. One of the major design features is the kitchen, an egg-shaped area in the great room cordoned off by its stainless steel countertops and horseshoe bank of cabinets. The precision and difficulty of the cabinetry job ultimately led to the choice of builder, Sparks’s Q&D Construction. ”They were concerned about finding someone who could build those cabinets; our in-house millwork manufacturing facility, Artéfice by Dianda, made us a logical choice,” says Sheila Hlubucek, communications director at Q&D. In one of the few disagreements between architect and homeowner, Bruder felt the radius-shaped cabinets—no straight lines—should be made of wood, while Feigin, admittedly not fond of the material, was reluctant. Q&D compromised by using a primavera wood with a transparent silver aniline stain and pearl finish, so that the sheen changes at different angles and it “has the warmth and feel of wood, without being pedestrian,” says Hlubucek. Cabinetry, however, was just a small part of the overall challenge. “Probably the most difficult part of the project was the foundation,” says Hlubucek. Multi-radius shapes and ellipses comprised the 50-plus complex curves that formed the foundation, all of which had to be laid out precisely. Q&D’s project coordinator used special electronic distance-measuring equipment to pinpoint coordinates—for light fixtures, plumbing, metal siding—ensuring that every piece from every subcontractor meshed into its proper place once onsite. Over the 16 months of construction, the teams imported fritted glass (printed with an original pattern of translucent lines that serve to diffuse the high desert light) from Singapore and hid structural supports with Venetian plaster. They laid concrete terrazzo slab floors, welded massive amounts of steel and metal (two metal subcontractors were necessary) and captured panoramic views of Reno and the Sierra Nevada. As Feigin considers building atop a ridgeline “sacrilegious,” the result wasn’t another grandiose monument. In fact, the home is, from various viewpoints, barely visible. Stepping through the hefty resin front door, one is immediately drawn to the great room, the highlight of which is the primitive fireplace consisting of a simple bronze platform with gas flame and chains—suggesting a chimney—extending down from the ceiling to camouflage the flue. Spartan décor consists of a few modern furnishings, chosen by Bruder and his staff, and tested for comfort by Feigin. The great room divides the house: One side curves to Feigin’s personal bath and bedroom; the other leads to the guest wing, offices, theater and dog room. Six pocket gardens fold into the flowing structure: A bamboo garden is tucked between the great room and the master bath, while a rock garden is recessed off the guest kitchen and living area. From the master bedroom is the patio water garden (complete with koi and goldfish, which Feigin says avoid becoming a “buffet for the birds” by hiding under the algae), where hidden stairs lead to the rooftop rock garden, blending the home into the hillside. Oddities and innovations abound through the house: In the bathrooms, Bruder personally placed cabinet pulls randomly on vertical or horizontal axes—all part of the sculpture, he says. The electric dog room door allows Feigin’s four canines to let themselves out. The three resin guest room doors are color-coded red, orange and yellow. Windows are set low, the view obscured for anyone much taller than Feigin’s five foot five inches.